I'm so sorry that during my first visit to this place early one weekday morning, it was closed! Standing outside the locked gates, I could see many many potted rose plants. I should have called to find out the opening times. Well, now I know that the nursery is usually opened after 2pm. Based on my telephone conversation with Mr Hew Pang Keong, the owner, he seemed to have a wealth of knowledge about roses, planting, care and propagation. I'm sure he will be able to teach and share information on rose growing. Yay, I'm so glad I had the chance to visit this nursery again. 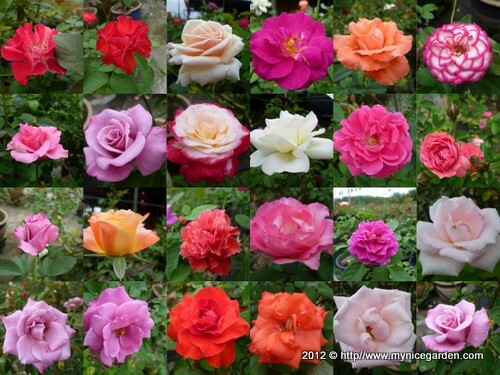 There are many varieties of roses to choose from. Some of the roses are as beautiful as those I saw at Floria 2011 last year. Most of the roses we buy are rose hybrids and cultivars. If you wish to know the names of the above roses, you can ask the owner. He has all the info at his fingertips about the roses that he grows. modern rose, hybrid teas, floribunda, polyantha, grandiflora, miniatures, etc. The roses are growing under the direct effects of full sun and rainfall without the need for a cover or shade. Some are sold in medium sized ceramic pots. Some are sold in plastic pots. Prices start from RM 12. Many are lowland roses that can thrive in our home gardens. bloom in singles or in clusters, some almost thornless. Flower sizes are miniature, small, medium or large. I've been told that lasting blooms are almost odorless while fragrant blooms are not lasting. Different varieties of roses have different petal colour, thickness, shapes and arrangement. There are so many varieties to select, I wouldn't know which is which and what to buy. Luckily, the owner was patient and willing to teach a newbie like me on the basics of growing roses. You can call him later if you need further assistance or encounter problems at home. Now, this is what I call good after sales service. He has David Austin garden roses. He also propagate new plants for sale. He says he can help you plan, plant and maintain your rose garden. You can buy organic rose manure here. We are advised to use fertilizer specially formulated for growing roses and not to use the general purpose chicken/animal waste pellets, grannulated form, urea, foliar sprays for our roses. He has the Christian Dior rose. For further details about Selangor Green Lane and location map, visit here. I thought this blog is only a directory, i should have visited it earlier. It is amazing and beautiful, and for you to showcase these nurseries will be lovely, imagine visiting nurseries always like that. I was just prompted by One's comment in the last letter we both receive. I echo her comments on this site. My dear friend, thank you very much for visiting and for your encouraging comments! Thank you for visiting this nursery. I've always wanted to enter it but never get a chance because its open only from 2pm. This post really make me wanna try on roses for my garden. Now that my garden has less plants due to pests so I have more room in my tiny garden. Thanks for sharing this valuable info. Captivating! Somehow I'm quite interested in roses now. And this is the place. The David Austin is gorgeous :) Thanks for sharing. Ash, welcome! Yes, we can grow roses in Malaysia! I grow them in medium sized flower pots. So good to enjoy their exquisite beauty and natural fragrance in our homes. Now I have red, pink, yellow and peach roses in my garden. Now I know where to get good roses from. Thanks. Hi, I'm interested to buy roses which are of small species in polybags. I need colours of purple, orange & christian dior rose plants & 2 bags of organic rose manure. Anna, please contact the nursery for further details. hello.. am interested in mandevilla climbing plant.. would like if anyone could help where i can get it or maybe ask t nursery to send it to me..
Biah, you can contact the listed nurseries directly by tel or email. Is it better to plant roses in pots or on the ground? It is better to buy rose plants directly from rose growers, than from roadside vendors, car boot sellers, hypermarkets. If you buy a healthy plant, it will grow, bloom and last very long. It is difficult for highland and temperate climate roses to thrive in our hot lowlands. I plant mine in containers. I find it easier to look after them this way. I bought 3 rose plants yesterday...my question is why do we need to pluck the rose buds before it is about 3 or 4 feet high..
Hi Danial, were you advised to pluck the rose buds? I guess the purpose is for your plant to reach maturity stage before letting it flower in order not to stress the plant. It is important to let a young cutting become establish before letting it bloom. Hi. This is danial again. Am writing for my mom. Do you have the christian dior rose now. The last time we went, it was out of stock. Btw, how much does it cost? Thank you very much Ms. Autumn Belle. Indeed a very accurate description of the nursery owner. I bought 2 named cultivar and two un-named. The man has so much of knowledge in rose plant maintenance. I think I would pay him a few more visits to get more rose gardening knowledge and buy a few more hybrid roses that he has yet to set into rooted cuttings for sale. Such a rose paradise locally for a rose maniac like myself... thanks Ms. Autumn Belle. Harap maaf, saya tiada menjual bunga. Sila hubungi penjual yang anda minat dalam senarai di atas. Thank you very much for your feedback (Anonymous?). I'm so sorry that you have gone there and have to go back disappointed. I don't really know what happened to them now. The nursery was closed for a year since June 2016 and re-opened in July 2017(if i'm not mistaken) as the lady boss was ill. Do pay them a visit again. Plenty of own root roses with ID. Thank you very much for the updates. I am looking for a climbing rose to plant. Any recommendations? Im from JB. Thanks!